In the past I had a hard time shifting into 4 lo when I'm out on the trails. Every time my gears would grind. Which tells me I am doing it wrong. I tried several different ways. While I was out in Moab my trail guide, K.L., showed me the "right" way to shift to 4 Lo. I tried it the last time I went to Rausch Creek. No problems at all. Easy Peasy! 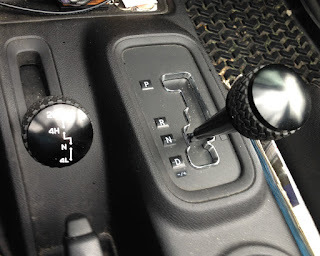 Step 1: While in Drive shift your transfer case to 4Hi. Step 2: Once in 4Hi shift your transmission shifter into N.
Step 3: Now shift your transfer case shifter from 4Hi thru N to 4Lo. Slow roll between 1 and 5 mph in neutral. Also shift quickly, don't drag it out.